Coarse filter – the incoming water falls over the perforated cone to remove large items like food scraps, washing machine lint and hair. 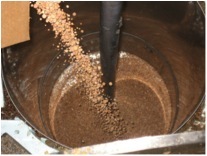 Woodchip – the water then flows from the buffer vessel into the wood chip media that removes fats, oil and grease (FOG) from the water. The wood soaks up the FOGs from the water. The wood also allows bacteria to lower BOD (biological oxygen demand) from the water.When the filter has been in continuous use about 14 days the surface of the chips darken and generates a mucus-like coating or bio-film. This is totally normal and no cause for concern. 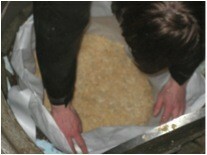 The bio-film is part of the treatment and contributes to the filtration. P Media – the water collects in the cone at the base and it pushed up through the P filter media to the outlet. This media adsorbs chemicals from the water and brings the pH ( measure of acidity) to neutral. 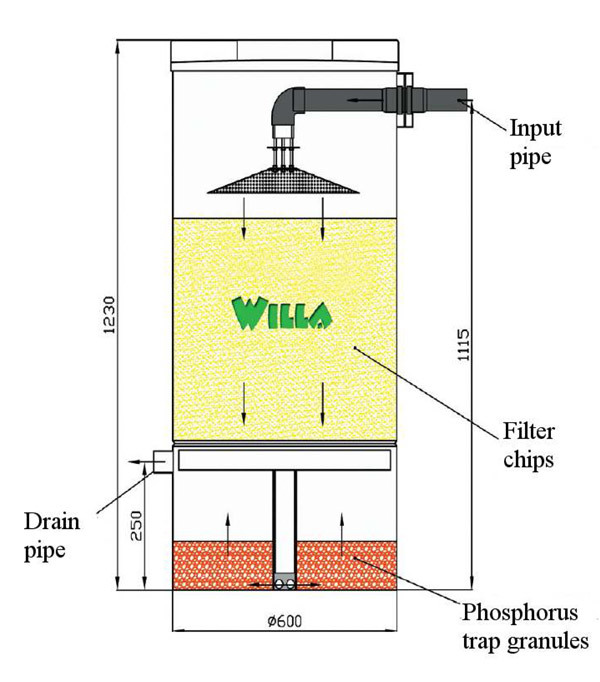 The Willa greywater filter can be installed above or below ground. 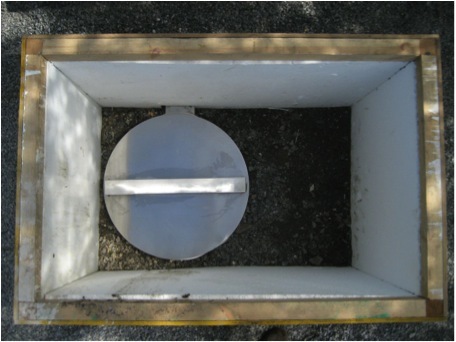 If it is installed below ground a chamber should be created for the unit that allows the bottom nut to be accessible.The inlet (50mm) is the upper connection, the lower (50mm) connection is the outlet. Downstream of the outlet a sampling access chamber should be installed to test the water in future. 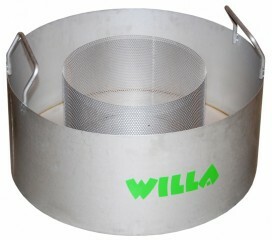 Fill phosphorus trap in Willa’s lower portion with lime granules about 30 kg (2 bags provided). 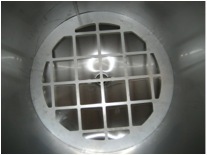 Place the funnel in place so that it goes under the bottom of the grid. Set the bottom plate grid firmly in place. Make sure it is level. Lift the wood chip bag into place. Open the bag and fold the upper part along Willa’s edges. Lightly press down the chips so that they lay evenly along the edges. Note when you add a new filter bag into the Willa, remember to cover the lid locking hooks on the upper part of the filter with the plastic covers that come with the product. Not doing this will result in treatment capacity being lowered significantly. If the inlet water point loads are large regularly (eg if you use washing machine, dishwasher and shower frequently and simultaneously), place the buffer vessel (included in the standard pack) on the chips. 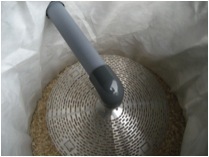 Use the supplied hooks on the edges of the filter. 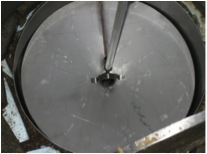 If the flow through the unit is too fast (incoming water flow > 0.5 litre / min), apply the plastic plugs in the holes in the buffer vessel one at a time until throughput is desired. If throughput is too slow and the buffer vessel threatens to overflow, clean holes in the buffer vessel. If this does not help then drill holes into the bottom of the buffer vessel (one at a time) until throughput is ideal (use 5 mm iron drill). Finally place the scattering cone, coarse filter into place. Cut a hole in the bag for the scattering cone. (Left picture with buffer vessel, right picture without buffer vessel). 8. 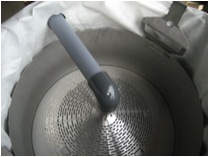 The lid has apertures to aerate the Willa greywater filter. Ensure that the installation allows air to get from the surface to the lid.